BERICAP offers suitable closure solutions for the dairy industry. Budenheim – November 26, 2018 Dairy products belong to a growing product group in global food consumption. Liquid dairy products are forecasted to grow by 30% between the years 2010 and 2020 to reach 350 billion liters. What will be essential for a sustainable growth of the industry will be a light, economic, environmental-friendly packaging of the products – while at the same time convenience demands increase continuously. Thanks to this vast expertise, its global presence and a quality as well as service level without compare, BERICAP is able to support producers in each continent. 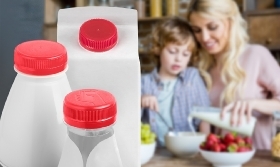 The entire range of closures for dairy products and all other product areas can be found in the new CapFinder on the company's website: www.bericap.com/capfinder.